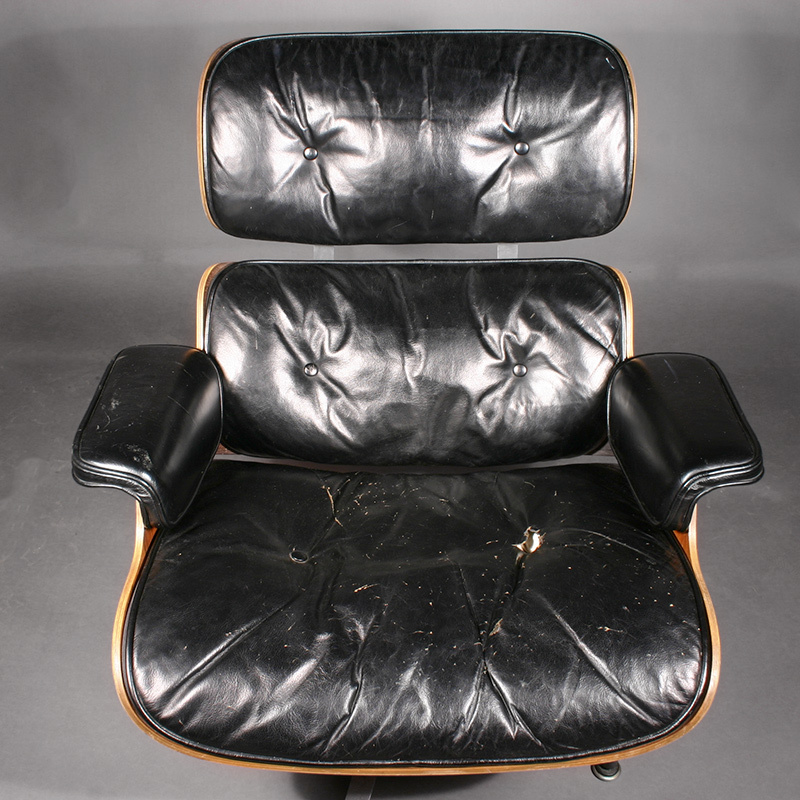 Eames Lounge Chair Set (670/671) Restoration — Bernacki & Associates, Inc. 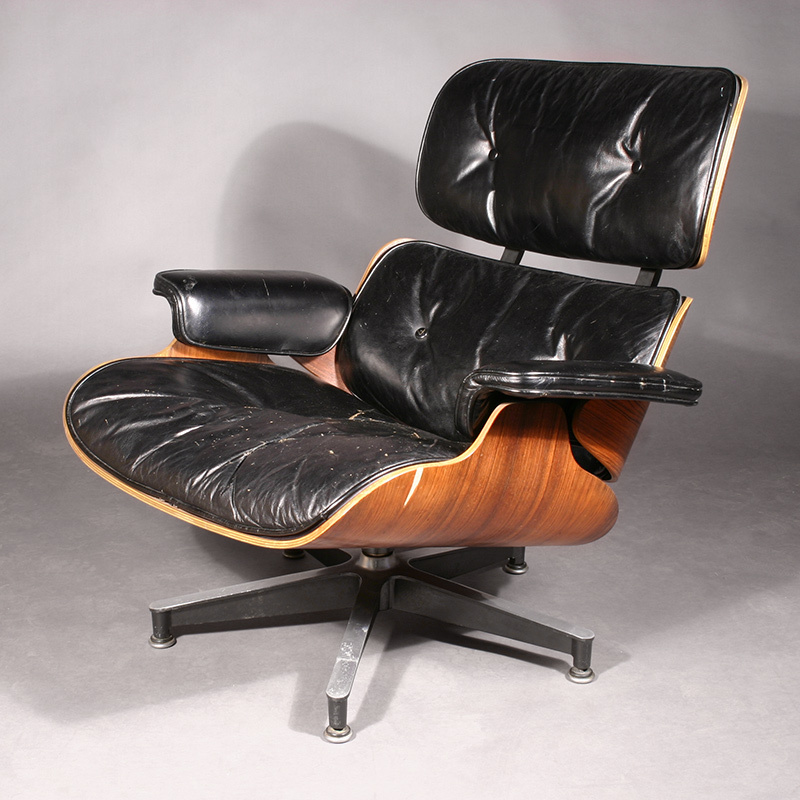 The commonly called Eames Lounge Chair set (670/671) was introduced in 1956 and has been since one of the most significant furniture designs of the 20th century. Engineered by the American design couple Charles and Ray Eames, the set is often called “the chair of the century” and is still received with enthusiasm for the beauty of the design and exceptional comfort. The Chair’s modern comfort comes not only from the way the headrest, the backrest, and the seat are ergonomically fashioned, but also from the unprecedented combination of the other components. The soft filled cushions finished in black leather with button tufting and the rocking connection system fitted with flexing shock mounts make the luxury complete. From the fabrication perspective, the famous chair combines modern technology with intricate traditional hand craftsmanship. The signature curved plywood components are made of several layers of glued together wood veneer and shaped under high pressure in industrial molding press. After the basic molds are made, the excess wood is trimmed to the desired shapes and the edges are smoothed. The plywood parts are then treated with a finish that enhances the depth of the outer veneer wood grain. 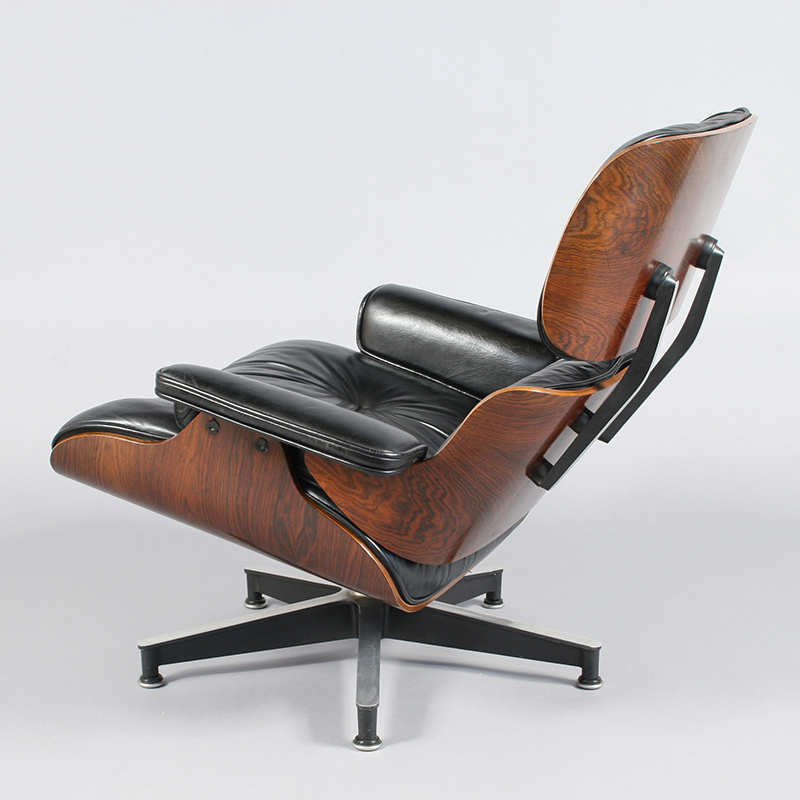 The original version made by Herman Miller in the mid-1950s used Brazilian rosewood veneer which was discontinued in the early 1990s. Still in production, Herman Miller uses veneers of cherry, walnut, Palisander rosewood (a sustainably grown wood with similar grain patterns to the original Brazilian versions), and other finishes. The original cushions were made of soft leather and plush down feathers similar to more traditional upholstered chair styles, despite its modern design. In 1960, a combination of foam padding was added to the down. The modern cushions are now padded with foam and Dacron. 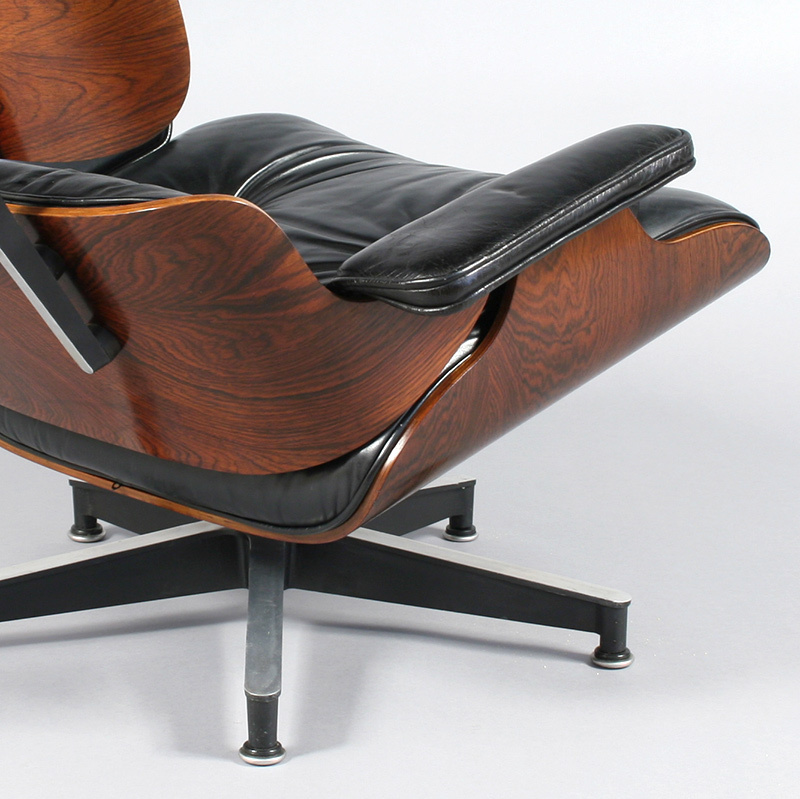 Iconic for their comfort and design, many chairs are still in use today. As with any functional object, components can tend to wear out over time. Even though the set is still in production, not all the components are compatible to facilitate partial replacement. Given the subtle changes in fabrication over the years; treatment to ensure their continued functionality while retaining their historic integrity, yields unique challenges and considerations. The following are four examples of past treatments for this iconic model. The chair arrived missing the metal riser at base. The veneer was selectively delaminating with related areas of loss on both the chair and ottoman. The finish was well worn, with a dull luster. The leather was dry and cracked, with tears, and loss at left and right-side armrest, and welt. The zipper was compromised. The cushion had lost support and shape. Leather was dry and cracked on seat cushions. The cushion panels were removed from frame of the seat and ottoman. All of the surfaces of the chair were cleaned. The delaminated veneer was consolidated, and loss areas infilled with comparable wood species sympathetic in tone and grain. A new Herman Miller Eames chair riser was installed on base. Surface imperfections were locally addressed and infills retouched and integrated. The surface was polished and waxed, hand buffed to a uniform sheen. The support was reconditioned, the down added in all cushions to restore shape and feel. The torn and or worn sections of leather and welting were mended. The leather was cleaned and conditioned. 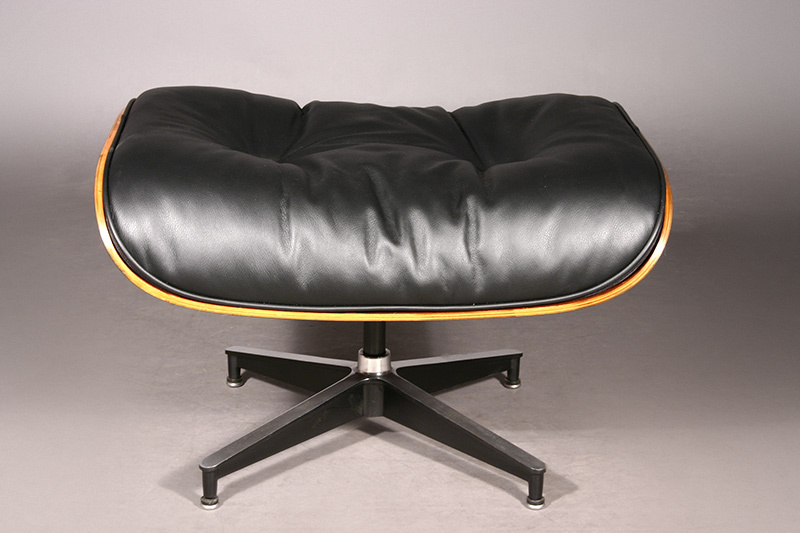 The studio worked with Herman Miller to replace the cushion zipper and back support. The metal base arrived dirty with scratches and corrosion. The wood frame sustained damage from water exposure with related areas of discoloration and damage to the finish. The decorative veneer had areas of delamination and related areas of loss. The outer edges of the wood elements were abraded with gouges. The leather upholstery was well worn with related tears, cracks, abrasion and grime. 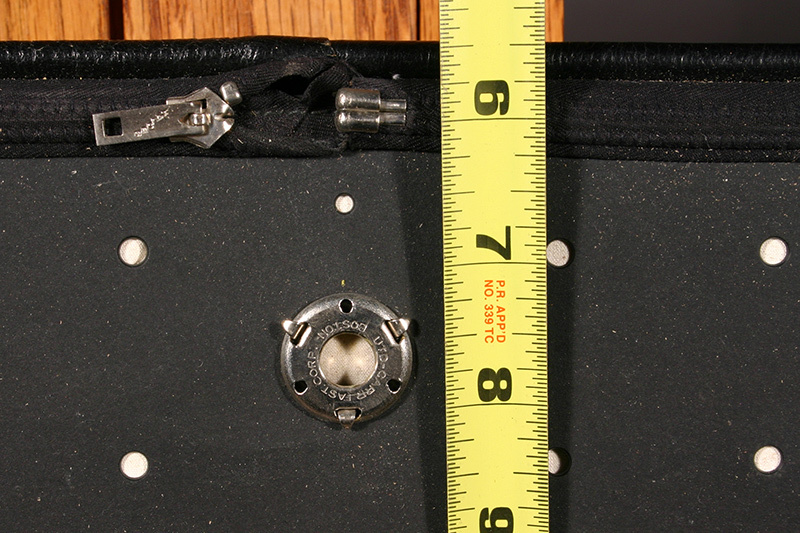 The attachment of the upholstered components was loose due to the corrosion of the hardware. The metal base was surface cleaned, the corrosion addressed and the scratches on the black finish base were retouched. The delaminating veneer was consolidated, losses infilled with a species matching in grain and tone. The oxidized finish was saturated, and areas in the finish were retouched and integrated where necessary. The treatment of the upholstery and metal attachments was completed by the manufacturer. Leather samples were provided for client’s approval. 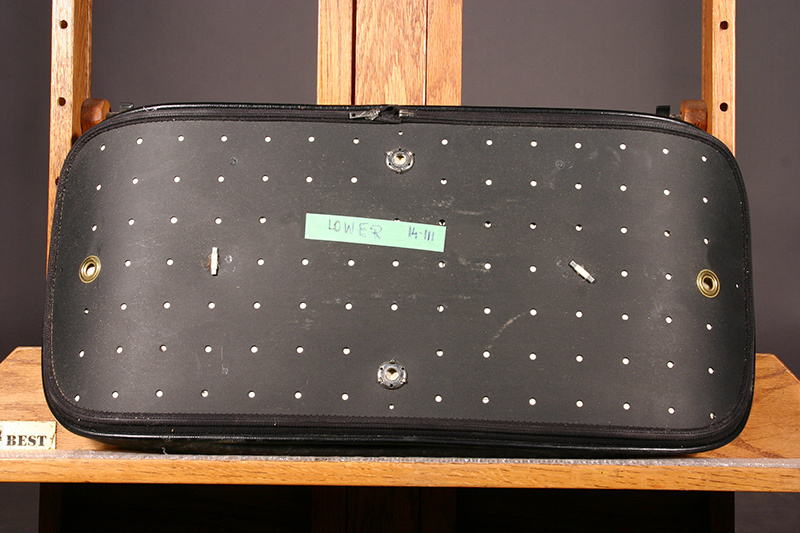 Above: During treatment photos show the disassembled upholstery components in preparation for collaboration with Herman Miller. The chair arrived at the studio in two parts due to a full break in the back rest. The arm pad was detached from the back rest on the side. The proper right-side flexing shock mount was broken. The seat and head rest panel were in good structural condition. The wood elements had minor imperfections, gouges, chipped veneer, scratches with various sizes, along with minor discoloration. The leather upholstery (cushions and arm pads) had some evidence of wear and cracking with minor imperfections such as in-prints and scratches. All metal parts (base and back braces) had similar evidence of wear as the other components. Unlike solid wood furniture, broken bent plywood parts could not be satisfactorily addressed with wood infills. The entire component must be replaced in order to ensure stability. Any attempt to repair the existing break in the chair panels would have rendered the chair as extremely delicate and use of the chair would have not been recommended. Given the historic Rosewood finish of the original panels, it was not possible to order just one new plywood panel to match the remaining panels. It was determined that the part must be ordered in a different veneer and then re-veneered in rosewood and treated for color to match the remaining panels. Given the cost involved, the client decided to proceed with a more cost-effective treatment, in which all of the plywood elements were ordered from Herman Miller and they were not re-veneered. The client was satisfied with the new look of wooden elements in the combination with existing upholstery. The following chair was damaged as a result of a ceiling collapse. The chair was broken in two parts with the seat section disconnected from the back rest, but not fully broken. The disconnection was caused by detachment of the top veneer layer from the bent plywood substrate which was located under the arm rests with a section of veneer still attached under the arm. It was a superficial and repairable break; while the rest of plywood shell was in good condition. Typical with chairs of this age, the veneered wooden frame of both chair and ottoman had scratches, chips on the edges, visible previous repairs, and slight discoloration. The back veneered frame was darker than the seat frame, most likely caused by a variance in exposure to sunlight from an adjacent window. The metal risers of both the chair and ottoman had scratches and an uneven sheen. 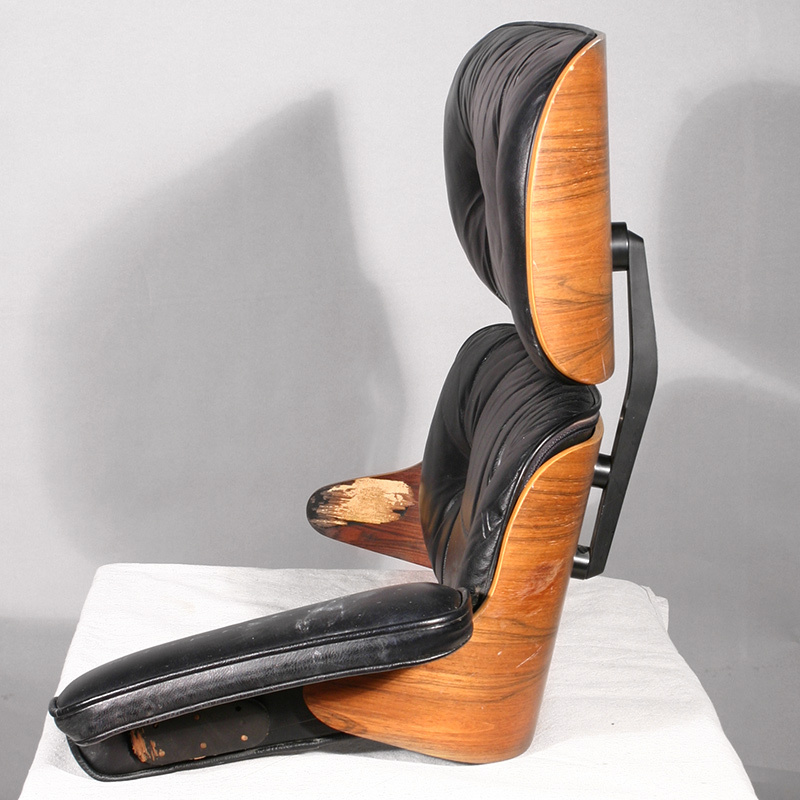 The upholstered seat and back cushions slightly lost their shape and support - visible by slightly sagging leather - which is typical from regular use. Since the client wanted to continue using the chair in the future, simply adhering the chair back together at the arms was not an option since it would not guarantee that the break would not occur again, as the bond had been weakened. Hence, the chair was disassembled, and the disjointed parts were shipped to the manufacturer for structural treatment. It was then assembled back together at Bernacki & Associates using hardware ordered from the manufacturer. The area of damage was retouched and integrated with the rest of the chair. The metal risers were cleaned and polished. The leather upholstery was cleaned and conditioned. These case studies reveal that even with a generally consistent design, a piece can sustain varying degrees of damage and require different approaches to treatment. At Bernacki & Associates each piece is individually assessed and treatment prescribed to best suit the item as well as the needs of the client. 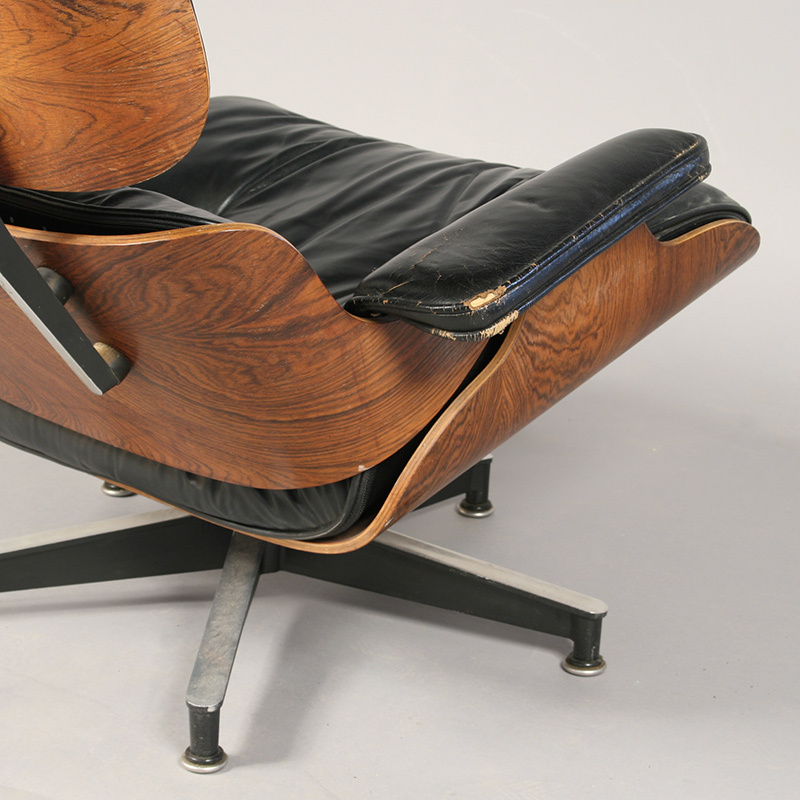 Charles and Ray Eames set out to design a lounge chair that had the “warm receptive look of a well-used first basemen’s mitt”. 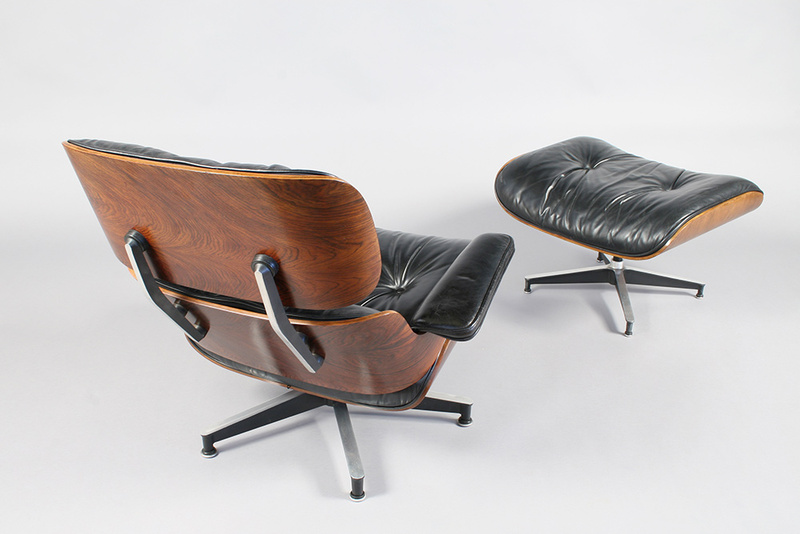 With the plush cushions, supple leather, contrasted with the contemporary plywood, metal base, along with the comfortable ergonomic design, they not only succeeded, they created an icon, one that is still revered over 60 years later.